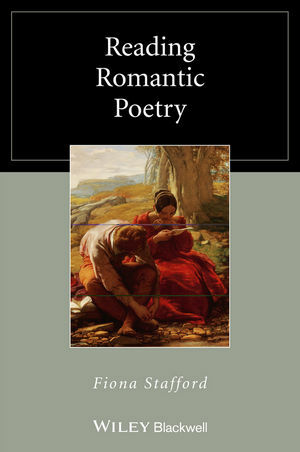 Reading Romantic Poetry introduces the major themes and preoccupations, and the key poems and players of a period convulsed by revolution, prolonged warfare and political crisis. Fiona Stafford is Professor of English Literature at the University of Oxford, and a Fellow of Somerville College, Oxford. She has published on a wide range of Romantic literature, and is especially interested in the literary relationships between England, Scotland, Ireland and Wales. Her most recent work, Local Attachments: The Province of Poetry, explores the vital connection between poetry and place from the Romantic period to the present day. She has also edited novels by Jane Austen and Mary Shelley and is the author of Brief Lives: Jane Austen. Chapter One: The Pleasures of Poetry. Chapter Two: Solitude and Sociability. The Romantic Resistance to Solitude. Public and Private Friendships of Poets. Chapter Three: Common C.ncerns and Cultural Connections. Chapter Four: Traditions and Transformations: Poets as Readers. Chapter Five: Reading or Listening? Romantic Voices. The Language of Conversation: Lyrical Ballads. Standard English and the Freedom of Speech. Chapter Seven: Poems on Pages. Romantic Poets: Then and Now. Christabel, and Other Poems, 1816. Reading according to Composition or Publication?